It's not exactly in Paris proper but in the close suburbs of the capital. The shocking view of the stark buildings is in wild contrast with the rest of the surrounding architecture. Nothing prepares you for the awe of the tall structures as you walk upon them. The visual shock is definitely a step into something we're not used to see, something very different, something a little scary. 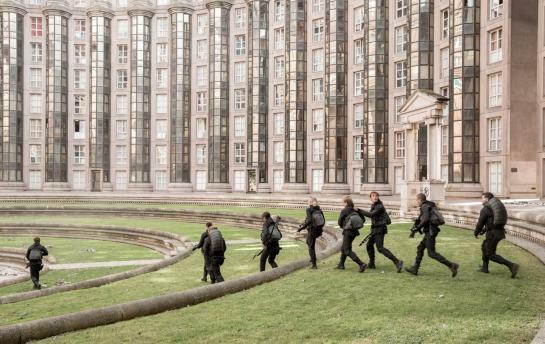 Even if you have not seen the Hunger Games movies, you know right away that this location is, or should be, a masterpiece of location scouting by a dedicated set designer. The unusual style and the strict rules of architecture are different here, anyone can sense that. Even though the movies and the books call their city Panem -- a nation established during an unknown time period in a post-apocalyptic world, somewhere in North America -- with a capitol in the Rocky Mountains, we know that movie studios do not always recreate what a director wants, and real place filming locations have been used again and again in movies. This particular place, outside of Paris, has not been used much, possibly because it's violently in-your-face, and impossible to visually dismiss. Once you've seen it, you will never forget it. Exactly what the makers of the Hunger Games wanted. The city is called Espaces Abraxas, a part of the Noisy-le-Grand suburb of Paris. A mere 40 minutes commute by bus or train from the French capital, it starts with a vast parking lot, then a mall, suddenly an arch later, one realizes the sheer size of the buildings imposing on the eyes. 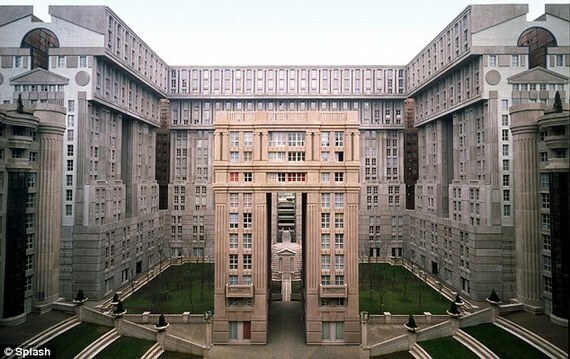 The complex of postmodernism architectural style was built between 1978 and 1983 by Spaniard architect Ricardo Bofill, a grand master builder of massive structures. Bofill has designed over 500 projects in 50 different countries in his long career. Situated in the department (region) of Seine Saint Denis, the ensemble of buildings includes three neo-classic spectacular residences with 600 apartments on 18 floors, baptized le Théâtre, l'Arc, and le Palacio. With dozens of staircases and an arch, the natural ambiance is already quite desolate and apocalyptic in mood. The antique rose-colored cement may be of a cooling effect in the summer, but in foul weather, it turns the place into an icebox. This is where filmmaker Francis Lawrence decided to shoot the fourth and last installment of the Hunger Games, with actress Jennifer Lawrence as Katniss Everdeen, an heroin. 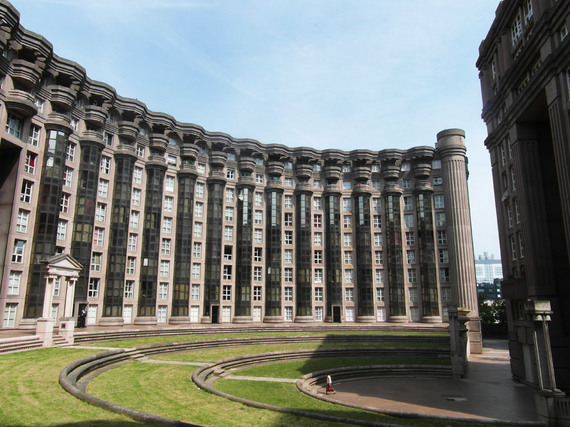 One can only wonder if Panem (the name of the capital in the movies) was somewhat also a reference to the nickname of the city of Paris, Paname.